Casino Mining Corporation is a wholly owned subsidiary of Western Copper and Gold Corporation, with full ownership of its flagship property, the Casino copper-gold-molybdenum-silver deposit in the Dawson Range Gold Belt in west central Yukon. Exploration first began in the Casino project area in the early 20th Century, with the first mineral claim dating back to 1911. Various exploration companies and individuals have conducted work in the area. In 1967 copper porphyry mineral potential was identified and in 1968 the Brameda Group acquired Casino Silver Mines. Exploration continued through 1991, and was directed towards characterizing the porphyry target. 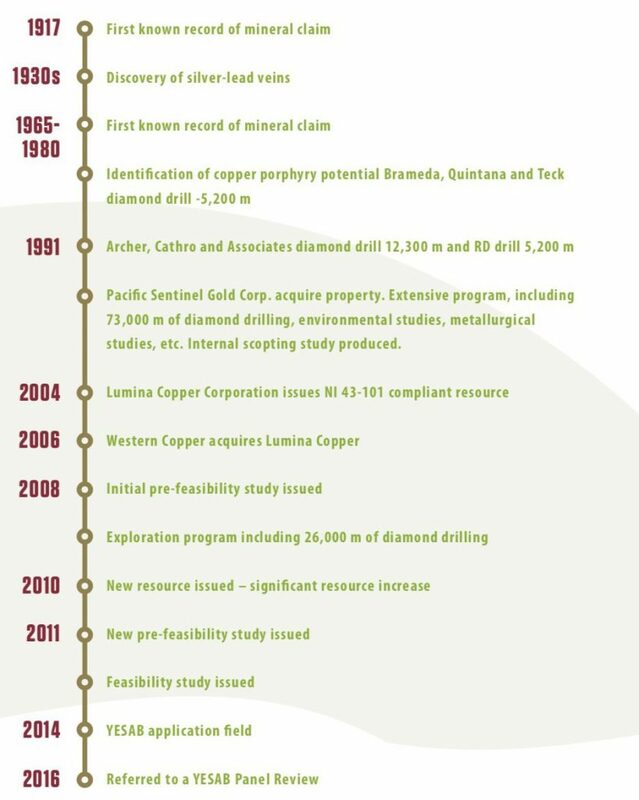 Pacific Sentinel Gold (PSG) continued exploration activities between 1992 and 1995 and produced an Internal Scoping Study. First Trimark Resources and CRS Copper Resources (which combined to form Lumina) brought the resource estimate to compliance during 2003 and 2004 with an NI 43-101 submission, a national set of standards of disclosure for mineral projects within Canada. Western Copper acquired the Casino project site in 2006 from Lumina and then established Casino Mining, which now owns the property. Casino Mining has been conducting extensive mineral exploration and evaluations of the property since 2006 to define a mineable ore-body. In January 2013, the company completed a bankable feasibility study report. In January 2014, the company submitted its Casino Project Proposal to the Yukon Environmental and Socio-Economic Assessment Board (YESAB) for an environmental assessment.